Jehangir Mehta opened Graffiti in the East Village of New York City in 2007 after receiving acclaim as a pastry chef at NYC restaurants including Aix, Compass, and Jean-Georges. From his tiny East Village kitchen he produces some of New York’s most exciting dishes. He is the author of the cookbook, Mantra: The Rules of Indulgence. More of Jehangir's story and recipes can be found in Unconventional, published by Alta Editions. This cookbook follows the paths of three young chefs, each successfully crafting incredible flavors in unexpected ways. In this book, Chef Mehta's style seamlessly blends Indian flavors with French techniques. 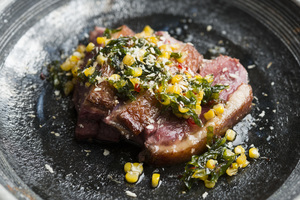 His recipes are highlighted by beautiful images from acclaimed food photographer Evan Sung.